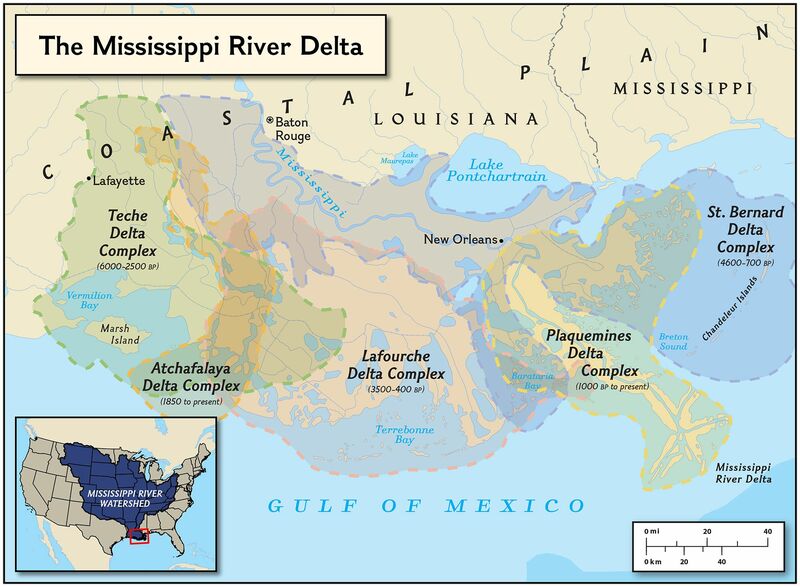 As the course of the Mississippi River changed over the last 6,000 years, sedimentary deposits resulted in a series of 16 distinct river deltas, also called deltaic lobes. The majority of these deltaic lobes are grouped into three of the five delta “complexes” seen here: the Teche, the St. Bernard, and the Lafourche. The modern Plaquemines Delta Complex forms the “bird-foot” Mississippi River delta that we are familiar with today, while the Atchafalaya Delta Complex is mostly the result of the man-made diversion of water by a U.S. Army Corps of Engineers project completed in 1963.